One of the first things you'll notice if you're a keen player of the game is the new set of locations available on the map; expect to stumble across Frosty Flights, Polar Peak, and more as you aim for your Victory Royales. As you can see from the chilling trailer above, a wintery theme has struck the island with all of the usual colourful chaos present. 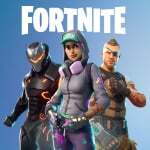 Naturally, a new season also brings with it a new Battle Pass (which has also received its own new trailer). As always, the Battle Pass contains 100 levels for you to work towards with more than 100 cosmetic rewards available for doing so, and costs 950 V-Bucks. One particularly interesting feature this time around is the addition of Wraps, which can be used to decorate your weapons and vehicles once earned. If you just watched the trailer above, you'll also have spotted the new X-4 Stormwing plane and a mention of an all-new Creative mode. This new mode lets you create, play, and save anything you can imagine on private islands, opening up opportunities for you to design your very own minigames from scratch. It's an interesting concept, and could well add a huge chunk of fun to proceedings - make sure to check that one out when it arrives later today. Will you be dropping in for another season of Fortnite? Do this season's offerings look like good additions to you? Let us know your thoughts down below. Unlike last season, I'm truly interested after a long break from the game. Mystic Gengar is back online! We have Warframe and Smash. Nobody needs this overhyped fidget spinner. And how dare you use a GoT reference while discussing this trash, you heretic? Picking up Smash preorder tomorrow but saving it for Christmas with the kids. Excited for this!!! @Sahnec Same! I was so excited once I saw the little intro video and theme.